If you use a recent version of FreePBX, you are familiar with the new and tedious method of entering Outbound Route Dial Patterns and Trunk Dialed Number Manipulation Rules. Fortunately, version 2.9 and above offer a way to import a list of patterns from a CSV file (there’s a way to patch FreePBX 2.8 to get this functionality as well — see Ticket #4691). What they don’t give you is a way to export a list of patterns once you have them installed. So if you want to clone a route and you’ve lost your original CSV file (or never had one to begin with because FreePBX converted your existing routes and trunks when you upgraded from version 2.7), what do you do? Fear not, because it actually is possible, if not exactly the most straightforward process. EDIT: Now there is an easy way around all this — see this thread on the FreePBX Swiss Army Knife Module. If you use that module, you don’t need to read the rest of this article (although, you might be interested in the part about editing CSV files). Unfortunately, it is reported that the module does not work with FreePBX 2.10 or above, and the author has said he will not fix it to work with newer versions. It is possible that the ability to export outbound route and trunk data to a CSV file may be present in the newest version(s) of FreePBX. EDIT: Steps 1 and 2 involve using a Database editor module to export the data to a CSV file. Unfortunately, one commenter says that this module no longer works with FreePBX 2.9. There are other ways to accomplish the same thing — see the edit at the end of this article to use Webmin or phpMyAdmin instead of the Database editor module. If you export the data using one of those other programs, then skip to step 3 below. Step 1: Go to the FreePBX bug tracker and look for Ticket #4793 — Database editor module (like phpMyAdmin for FreePBX). On that page you’ll find a download link for dbeditor-1.0.tgz which (at the time of this writing) is the only version of this software available. Download and install it as you would any third-party module (download it to your computer, then in FreePBX’s GUI navigate to Module Admin and then click the “Upload Module” link, then upload the module and follow the directions to complete the install). Step 2: Once you have the Database Editor installed, it will appear under the FreePBX “Tools” tab, in the “System Administration” section. Click on the “Database Editor” link, and you should see a list of database tables used by FreePBX. The two you are interested in are called outbound_route_patterns and trunk_dialpatterns. Near each pattern name you will see two links for “Export” and “Drop” — do not click either of those (especially be careful not to click drop! ), because the “Export” here will export the table in MySQL format, which is not what you want. Instead, click on the name of the table (that is, click on either outbound_route_patterns or trunk_dialpatterns) and a new page will open. Near the top of the page you will see a place where it says, “Export to CSV: pipe – tab – comma – semicolon” — click on comma and it should bring up a file save dialog that will let you save the file to your system. Step 3. Load the downloaded file into any text editor that can deal with Linux/Unix-style line endings and not change them (so, don’t use Notepad! ), or better yet, use a CSV editor if you have one (an excellent free one is CSVed, which runs under Windows but will also install and run under CodeWeavers’ CrossOver on a Mac, which tends to make me think it would probably also run under WINE on a Linux or Mac OS X computer). I do NOT recommend opening the file in a spreadsheet application such as Excel, because if you have any patterns that start with one or more leading zeroes, those might be removed, and it’s also possible that any non-numeric characters may be misinterpreted or removed. The first number in each line is associated with a particular outbound route or trunk, so, you want to cut out the lines not applicable to the route or trunk you want to keep. Don’t erase the top (header) line. If you have many routes or trunks, it may be a bit tricky to figure out which is which, since the numbers don’t tell you the name of the route or trunk they are associated with. After you do that, you also have to get rid if the first column in each line. So let’s say you are using route 3, and each line starts with 3,. What you want to do is a search and replace on <newline>3, (or expressed as a regular expression: n3,) and replace it with a newline only (n as a regular expression). 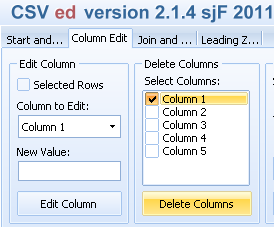 In a CSV editor you may be able to just delete the first column. For a trunk, the principle is the same except that you will need to remove the first AND last columns, leaving only the middle three. While you’re at it, it’s also possible to use search and replace in other ways. For example, if you are duplicating list of outbound route patterns but need to change the extension field pattern in all lines, you could do that using search and replace, if you understand what you’re doing. Visually inspect the lines following the header to make sure you have four fields separated by exactly three commas. Visually inspect the lines following the header to make sure you have three fields separated by exactly two commas. Also, and this applies to trunks only, if it is important that trunk dial patterns be in a particular order then you will want to check to make sure they are in the correct order in the CSV file, since the “seq” column is not preserved. In many situations this is not an issue but in certain special cases the order of trunk dial patterns can make a difference in how they are processed. Step 5: Save the modified file to a file with the .csv extension (if using a CSV editor make sure you are saving in comma-delimited format). Again, try to make sure your editor doesn’t change the line endings – I don’t know for certain that it would make a difference, but it might. Step 6: Now you can create a new route or trunk, and in the “Dial patterns wizards” or “Dial Rules Wizards” dropdown select “Upload from CSV” and select your file to upload. Note that if you are using a beta version of FreePBX 2.9, it may complain if you try to submit an outbound route with no patterns, even if you are uploading a CSV file. In that case, just put a single “X” in the “match pattern” field. After you submit changes, be sure to scroll through the patterns to make sure they appear to be correct. In particular, make sure that all values are in the correct fields. There are probably other ways to accomplish this, and maybe eventually the FreePBX developers will add an export function on the route and trunk pages (obviously, it would probably not be a good idea for me to request it, and besides, it appears that someone already has). For export destination, use whichever is more convenient for you (note that if you “Save to file” it will be placed in a directory on your server, so you might find it easier to display it in a browser window and then save it from there). Then click the “Export Now” button. If you exported to a browser window, use Ctrl-A to select all the lines, and Ctrl-C to copy them (⌘A and ⌘C on a Mac), then proceed with Step 3 above (except use Ctrl-V or ⌘V to paste the lines into the text editor). Or, if you prefer to use a CSV editor, then in your browser simply go to File | Save Page As… and save the entire page as a plain text file with a .csv extension to your local machine, and then proceed with Step 3 above. If using phpMyAdmin, from the main page select “asterisk” in the left-hand column, then (still in the left-hand column) either outbound_route_patterns or trunk_dialpatterns, depending on which you want to work with. Then click the “Export” tab in the main window, and then under “View dump (schema) of table”, in the “Export” section select CSV. The view should change to show an “Options” section, and there you want to change “Fields terminated by:” from a semicolon to a comma, and then check the “Put fields names in the first row” checkbox. Then click the “Go” button and it should display the data in a format that can be copied and pasted into a text editor. Sorry, that’s the best I can advise you with regard to phpMyAdmin, since I seldom use that program (and I may have an older version, so things might have changed slightly). This article was originally posted in February, 2011 and may be out of date. You may also wish to read Link: How to Install and Setup Monit (Linux Process and Services Monitoring) Program. Here’s an article that will be helpful to may of you who are running PBX servers under CentOS, especially (but not limited to) those running on virtual machines with low disk storage space. Note that if you installed from an “all-in-one” distribution ISO, this possibly might already be installed, but may still need to be configured. One thing you definitely don’t want to happen to your server is for it to run out of disk space, especially the root partition. There are lots of pieces of open source monitoring software, a popular one being monit. The instructions should work for any system running CentOS 5.5. You might be tempted to take a shortcut and just do “yum install monit” but please be aware that (at least as of the day I’m writing this) it will get you a much older version of the software, so I suggest you stick with the instructions in the article. I have just now installed this on one system and have not fully tested it, but it did send an e-mail confirming that it had started. This is just another tool you can use to make your life a little easier and help you avoid a problem before it becomes a major headache! If you use Webmin regularly, you’ve probably noticed that it is starting to look pretty dated. There is a solution and that is to change the theme to the new Stressfree theme. It is a much nicer design and doesn’t affect any of the applications associated with Webmin – just the look and arrangement. Go to the full post with installation instructions.